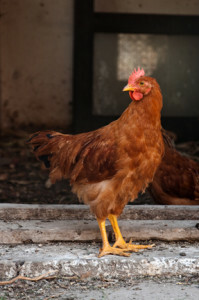 Molting is the process wherein hens lose feathers and grow new ones. It occurs naturally after 10 to 14 months of production, or it can be caused accidentally by temperature extremes, running out of feed or water, a decrease in light, or disease. Hens will not lay eggs during a molt. Molting gives birds a chance to rest. After seven to eight weeks, they will return to production for a second cycle, though they will not be as productive the second time around. However, they will often lay larger eggs than during their first cycle. If you have any questions, please give us a call or stop by the store. This entry was posted on Saturday, May 16th, 2015 at 1:19 pm	and is filed under News & Updates. You can follow any responses to this entry through the RSS 2.0 feed. You can leave a response, or trackback from your own site.